Since the dawn of the internet age, there has been no shortage of stories about hackers, malware-peddling malcontents, online scams and identity theft. Add to that the growing consensus that wars in the future will be fought online through “cyberwarfare divisions”, and you can understand why such positive statements once made about the internet – like how it would bring the world together and create “a global village” – would seem incredibly naive now. However, despite the prevalence of hacking and cyberwarfare-related fear, very few people have actually experienced what it is like. After all, the effects of hacking are mostly invisible to the untrained eye, with the exception of very-high-profile database breaches. Now, though, a security company has produced a fascinating geographic map that shows global hacking attempts in real-time. And of course, the ongoing battle between US and Chinese forces accounts for much of it. The real-time map, maintained by the Norse security company, shows who’s hacking who and what attack vectors are being used. The data is sourced from a network of “honeypot” servers – essentially a juicy-looking target that turns out to be a trap -maintained by Norse, rather than real-world data from the Pentagon, Google, or other high-profile hacking targets. The Norse website has some info about its “honeynet,” but it’s understandably quite sparse on actual technical details. If you watch the map for a little while, it’s clear that most attacks originate in either China or the US, and that the US is by far the largest target for hack attacks. You can also see that the type of hack used, indicated by the target port, is rather varied. Microsoft-DS (the port used for Windows file sharing) is still one of the top targets , but DNS, SSH, and HTTP are all very popular too. CrazzyNet and Black Ice – two common Windows backdoor programs often used by script kiddies and criminals – is also sure to pop up. On occasion, the map is likely to show a big burst of coordinated attacks coming from China and directed towards the US. 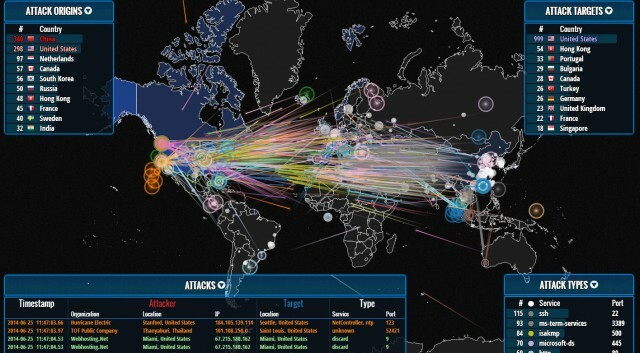 And while it is difficult to blame these attacks directly on the Chinese government (as they are adept at routing their attacks through other servers) government and independent researchers are confident the majority of these attacks are being directed by the People’s Liberation Army’s Unit 61398 – aka. the PLA’s cyberwarfare division. A lot of hacks originate in the US, too, but their targets are much more varied. And in cases where Chinese facilities (or other nations that are nominally identified as hostile to the US) you can bet that the US Cyber Command at Fort Meade is behind the lot of them. But the map is still limited in that it uses Norse’s own honeypot operations to identify these attacks, and it therefore cannot be said with absolute certainty that real attacks happen in the same fashion. But a general picture of the size and shape of global hacking and cyberwarfare can be divined by looking at the stats. Back in 2012, the US DOD reported that it was the target of 10 million cyber attacks per day. Likewise, the National Nuclear Security Administration says it saw 10 million attacks per day in 2012. In 2013, BP’s CEO said it sees 50,000 cyber attacks per day, and the UK reported around 120,000 attacks per day back in 2011. While the extent and purpose of these attacks certainly varies, it is pretty clear that hacking and cyberwarfare is a global problem and something that governments, corporations, and institutions need to pay attention to. Last year, the Obama administration’s announced that it would not sit idly by in the face of stepped up attacks from China. However, the subsequent testimony and document leaks by Snowden showed that the US has been conducting its own attacks the entire time (and even beforehand). And such is the nature of war, regardless of the context or the weapons used. States rattle their swords claiming they will not tolerate aggression, but there is always a fine line between maintaining one’s defenses and escalating a situation to the point that mutual destruction becomes inevitable. Perhaps the people who are currently fighting this alleged cyberwar should look to the past – specifically to the First World War and the Cold War – to see just how effective “arms races” are!